The Guest PR Author is a catch-all for Public Relations companies and professionals who place articles on MyPR without registering for a free user account. Registering will place your articles under your Author Name and give your PR Business much greater exposure. Placing articles is for free. Click Here to receive free content for your publication. 2018 is proving to be the year of innovation for exhibition stands. With advancements in artificial intelligence, healthcare and automotive technologies launching the world into a new era of electronics thus far, Innovation Factory, an award-winning shop-fitting and exhibition stand design company, has implemented improvements of their own. With an assortment of innovative technological aids, as listed below, Innovation Factory aims to ensure that their exhibition displays stand out from the crowd. 1. Interactive Apps Interactive business apps are effective: they allow people to engage and learn about your products and services in a fun and exciting way. For example, someone who is interested in taking a look at your latest sports car might enjoy a game where they’re able to customise and ‘build’ the car, discovering all the features as they play. Now, imagine the alternative: a 6-page handout with lots of technical jargon and a couple of static images. It’s not much of a contest, and one of them can go in the bin. By creating your own bespoke app, customers can interact with your brand content at their own pace and — perhaps most significantly — long after the event, on their smartphone. For added interaction and quirkiness, you can place QR codes around your stand for people to scan for extra nuggets of information about your products and services. 2. Augmented Reality This impressive technology works by integrating computer-generated scenes with a live view of the real world for a 2D or 3D interactive experience. From making print come to life to allowing participants to zoom, turn and manipulate your product in real time, using AR can be a total game changer for how people engage with and understand your offering. Allowing your customers to explore your products with this real-time technology can help to create a truly memorable brand experience. One only has to look at phenomena like PokemonGO to see the viral potential of AR technology. 3. . . .
ExxonMobil Basestocks Strengthens Branded Distributor Network in South Africa • New branded distributor in South Africa expands ExxonMobil’s current market offerings • Bolsters the company’s long-term commitment to meet customer needs Johannesburg, South Africa - ExxonMobil today announced it has signed a new distributor agreement with Zestcor, an experienced sales, procurement and supply chain management company in South Africa. 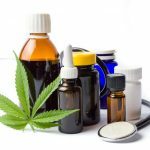 The agreement is designed to support an efficient and reliable supply of high-quality base stocks in South Africa and the sub-Saharan region. Zestcor has a distinct local business footprint in the South African petrochemicals industry as a Broad-Based Black Economic Empowerment Company. This commercial relationship will expand ExxonMobil’s global presence and provide local customers additional access to base stocks capable of meeting a broad range of blending needs. “We are committed to providing a reliable supply of high-quality products to our valued customers around the world,” said Julia Ruessmann, EAME Basestocks and Specialties Sales Manager at ExxonMobil. “Zestcor not only complements ExxonMobil’s position in South Africa by providing local supply chain solutions, but supports our long-term commitment to meeting customer demands in country.” Zestcor is uniquely equipped to receive bulk ExxonMobil shipments and handle both truck loading and delivery, as well as pipeline transfers, with their strategically placed bulk onshore tank storage facilities at Bidvest Tank Terminals in Island View, Durban. “At Zestcor, product integrity and quality control are at the forefront of what we do,” said Nic Dunn, Director at Zestcor. “Partnering with a global leader like ExxonMobil, who not only shares these values, but promotes them as a pillar of their business operations, makes perfect sense for us. We also believe that South Africa will benefit by having additional local access to high-quality base stocks.” As a distributor . . . 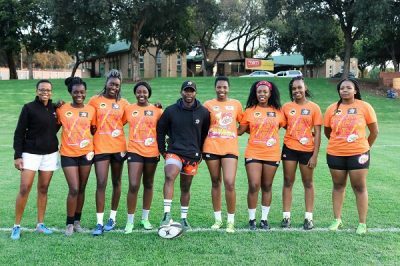 The University of Johannesburg women's sevens rugby team, having come close in previous years, are determined to go all the way when the University Sport South Africa tournament is held on Saturday. The UJ team have been undergoing intensive preparations for the tournament, to be hosted by Wits University in Johannesburg, as they aim for their first ever title. Team manager Tumi Leseke said they had placed consistently in the top three since the tournament began in 2013 and were now fired up to finish on top of the rankings. "We believe we really have a good chance of winning this time," she said. "We are hungry for it and we have laid the groundwork to go all the way. I truly feel this is our year." She added that their biggest challenge would be "to control ourselves and our mentality as a whole". "The way we approach every game and every opponent is up to us. If we choke then it will be on us, but I don't believe that will happen. "The girls want it with every fibre of their being and have been pushing themselves harder and harder in training. They are ready." Leseke said their biggest strength was that the team members were never left wondering what could have happened. "These girls leave it all on the field and you could say they play like their lives depend on it. "That is something you cannot coach or teach someone to do and it makes us dangerous and entertaining to watch." Even given their determination to succeed, the UJ manager acknowledged that the competition would be tough. "All the teams have their strengths and pose a considerable threat," she said. "We know all our opponents have been working hard and believe it's their turn to take the cup. So as a team all we can do is keep our heads down and play our own brand of rugby. If we can do that, I am confident we can do well." Under coach Mbuyiselo Siqebengu the squad have been going through an intense programme of tests, which have focused on their endurance and . . .
Women4Women: A female empowerment foundation working towards success one step at a time. Focused exclusively on female empowerment and community development, Women4Women is a dynamic NGO increasingly making an impact on the South African socio-economic landscape. 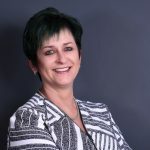 Founded by former Miss South Africa and local businesswomen, Cindy Nell-Roberts, Women4Women has launched several successful initiatives that aim to mobilize economic growth through a strategy that places the interests of women firmly at the centre. It’s the realization of a long-term dream for Nell-Roberts who believes that active participation in social upliftment is a moral obligation that many South Africans are loath to admit. She says: “It’s my intention to do everything that I can to give back and help to create a more advantageous future for as many women as possible. I truly believe that those who are fortunate enough to be in a position that allows them to give back should do so, and I intend on utilizing my years of experience in the industry and corporate affiliations to follow through on this.” With this in mind, Women4Women has clear objectives when it comes to approaching the challenges faced by many women in South African society. Importantly, it’s an approach that is multidimensional in nature. For Nell-Roberts and her team, the help that they can offer extends to facilitating corporate funding for female entrepreneurs, connecting mentors with underprivileged youth, skills development workshops or something as simple as offering make-up tutorial lessons that help build a greater sense of self-worth. In short, Women4Women is able to assist on a variety of levels in order to ultimately bring about job creation, increased income levels, the growth of female-owned businesses and entrepreneurship as well as empowering females of all ages and from all spheres of life to improve their circumstances. To this end, although operating as an independent organization, Women4Women has chosen . . .
Saturday, 28 April 2018: Femi Koya Date: Saturday, 28 April 2018 Performers & times: Femi Koya Sound check – 16h30 Performance – 18h00 to 19h00 Cost: Free Venue: V&A Amphitheatre Contact: V&A Information Centre on 021 426 1233 / info@waterfront.co.za Providing a platform for emerging South African musicians and musical ensembles to showcase their talent, up-and-coming artists will take to the stage on select weekend afternoons until the end of Autumn, in free-to-attend musical performances at the V&A Amphitheatre. Femi Koya will perform at the V&A Amphitheatre on Saturday, 28 April from 6pm, entertaining audiences with a blend of Afrobeat and contemporary groove music, infused with West African highlife and jazz. His life story – a migration across the continent from West to South – inspires his music and can be heard in his debut album Just in Newtown. Sunday, 29 April 2018: ZionThree3 & Jimmy Nevis Date: Sunday, 29 April 2018 Performers & times: ZionThree3 Sound check – 15h30 Performance – 16h30 to 17h00 Jimmy Nevis Sound check – 17h00 Performance – 18h30 to 19h30 Cost: Free Venue: V&A Amphitheatre Contact: V&A Information Centre on 021 426 1233 / info@waterfront.co.za The V&A Waterfront Summer Concerts, presented by the new smart car, are here to liven up the summer! Taking place at the V&A Amphitheatre on select weekend afternoons, these much-loved musical performances offer acoustic concerts by both up-and-coming and well-known names against views of Table Mountain and the city – making this the perfect way to spend a summer’s evening. Kicking off the performances on Sunday, 29 April, is ZionThree3, a trio of South African vocalists best-known for pop and R&B music, who will perform at the V&A Amphitheatre at 3.30pm. The trio, Tashwin Manuel, Bradley van der Zandt and Dillon Powell, are childhood friends and all grew up in musical and spiritual homes, beginning their singing . . .
17 April 2018, the 21st PRISM Awards are ready to take off on 22 April at Jozi’s latest star-studded skylight location, The Empire Conference & Events Venue in Parktown Johannesburg. Africa’s leading public relations and communication professionals have submitted over 230 entries, judged by over 67 judges alongside 11 PRISMs Young Judges, and will be eagerly awaiting the final results of their efforts on awards night. This year’s MC will be broadcast duo; award winning Radio Personality, Gau TV and Bona Retsang television Presenter and Social Entrepreneur Melody Miya. This year’s partners and media partners include: BizCommunity, Mark Lives, Media Update, African News Agency and Newsclip, Vuma Reputation Management, FlieshmanHillard, Atmosphere, Flint and Tinder Events, Expand A Sign, Samsonite, Alexander Forbes, Innovative Glass, CIMA, The Daily Sun newspaper, youth content creation start-up Hip-Hop 411, Afroflame hostesses, Lounge Around Décor and Furniture, GroundUp Media and The Peartree Conferencing centre. The PRISM Award ceremony will start at 16h00 and ticket prices for entrants are R570, and for guests R700, and can be purchsed through Nutickets. https://prisa.nutickets.co.za/PrismAwardsCeremony2018 CLICK HERE to submit your press release to MyPR.co.za. . . .
Longridge Wine Estate has just released the 2015 vintage of their highly acclaimed Ekliptika Bordeaux blend, which was scored 94/100 by Tim Atkin and awarded five stars in the 2018 Platter Guide. Only 6684 bottles will be available to consumers. The blend is shaped by terroir and is composed of the best batches of Cabernet Franc, Merlot and Cabernet Sauvignon rooted in the oldest viticulture soil in the world made up of decomposed granite on the lower slopes of the Helderberg Mountain. The vineyards enjoyed the refreshingly cool breezes from False Bay (Atlantic Ocean) during the day and cool air mountain air at night, resulting in even ripening of the berries and good, natural acidity. According to vintner Jasper Raats, both the name and the label illustrate Longridge’s biodynamic way of farming. During the winemaking process, Raats and fellow wine maker Hendrien De Munck followed their usual natural, organic approach. “The vineyards are meticulously cared for by hand and the crop is reduced to ensure maximum quality. This wine is made naturally by not making use of any commercial yeast, enzymes or fining agents. It is further not filtered or cold stabilized and may therefore in time show harmless sediment,” says Raats. Named after the orbital occurrence when the earth, moon and stars align in their path around the sun, the Ekliptika was matured in a combination of new and mature French oak barrels for 24 months and with proper cellaring, this wine will improve and continue to reward over the next 6-8 years. Dark and concentrated in colour, this wine greets you on the nose with aromas of ripe red fruits, plums and pencil shavings which follow through onto the palate with chewy black cherries, sweet spices and tannins on the mid palate and a lingering umami finish and is described by Tim Atkin as a serious, well-structured red with good texture and leafy top notes. The 2015 Ekliptika retails at R515 from leading outlets countrywide as well as at the . 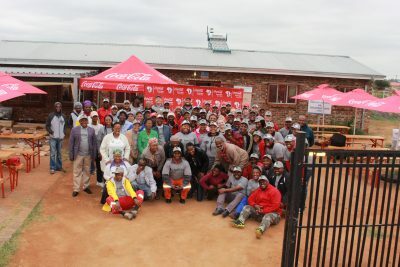 . .
Coca-Cola Beverages South Africa (CCBSA) as part of our corporate social investment initiatives, our goal as a company is to contribute meaningful support that will uplift our chosen beneficiaries so they can continue making a positive impact within our communities. We have invested over R115 000 towards uplifting the Readira Community Nutrition and Development centre and through our Corporate Social Investment (CSI) day, employees from Kimberley and Vryburg spent the day refurbishing the centre. The Readira Community Nutrition and Development centre which was established in 2003, provides nutritious meals to the Galeshewe community after noting the challenges of substance abuse, unemployment, HIV/AIDS and poverty in the area. They provide meals to over 216 beneficiaries daily and look after TB and HIV/ AIDS patients referred by their local clinic. They also provide assistance for pauper funerals and guide community members on how to apply for identity documents. The team painted the inside walls, colourful murals and assembled wooden benches and tables. Their vegetable garden was also boosted with seedlings, beds and protective shade so they can grow more vegetables to use for their meals. Work is underway to extend the building with another room that will be used to serve the community. In addition we are donating kitchen appliances such as a fridge, microwave and pots to make meal preparations easier at the centre. We also partnered with our colleagues from the Department of Social Development, who also volunteered thirty of their employees to assist in the day’s activities. CCBSA Central District Manager, Steven Turner noted that giving back and supporting our communities is especially important as they buy and support our products. CLICK HERE to submit your press release to MyPR.co.za. . . . Operational since 2003, Oxbow is a renowned company, situated in Cape Town. This company specialises in the sales and services of the Xerox office automation machines. Being a dynamically proactive and passionate company, it provides high-end services that have made them as one of the most popular resellers of Xerox equipment in South Africa. The core focus of this company remains on providing the best services to their clients. Mission of the company Oxbow is renowned for its dynamic nature and passion for achieving customer satisfaction. However, the mission of the company is discussed below. Offering the best products that exhibit the unique qualities of performance and values. Providing outstanding customer care service. Enhancing the skills of the employees by developing their full potentials. Encouraging the entrepreneurial spirit Maintaining the highest standard of business ethics. Going beyond the expectations of the stakeholders. However, some of the important services provided by Oxbow are discussed below. 1. Xerox Technical Service Oxbow is considered as the best resellers of Xerox equipment in Africa. They offer a wide range of Xerox machines catering to all sorts of requirements for their customers. The Xerox consultants of Oxbow are highly experienced. The Xerox installation service provided by them have an option to include Managed Print Services that can automatically log all the technical calls and in fact can order toner even before you can become aware of the requirements. 2. Managed Print Services This Cape Town based company offers a service that gives you relieve from the pain of logging calls and managing every printer activity on your network. Their unique software comes with the unique feature of customisation to cater the basic needs of the customers. 3. Oxbow Eco Energy Oxbow soulfully believes in the process of using recycling and renewable energy. Their EcoEnergy section is certified by Eskom. They are . . . In what should be of immense benefit to South African cyclists, Positive Sports Solutions have struck a deal with Horizon Global to distribute a top-branded German-designed bike rack in Southern Africa. 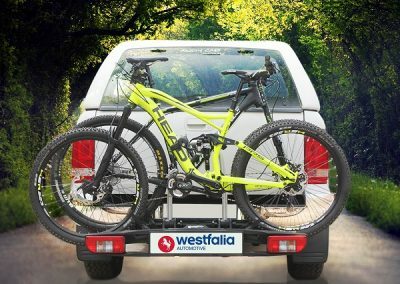 Originally produced in Germany for the European markets, the Westfalia bike carrier is now being manufactured in South Africa and will be available to local consumers in the second half of 2018. It is rated as one of the best-known bike racks in the business. The deal came about when the Westfalia Automotive company, based in Germany, was acquired by Horizon Global (a US-based company), who are one of the largest manufacturers of towbars in the world. Horizon Global also have a manufacturing footprint in South Africa where the German-designed bike carrier will be manufactured both for the local market and into other parts of the world. A natural extension of the towbar is the bike carrier and this led to Positive Sports Solutions signing a sole distribution agreement with Horizon Global South Africa to sell the bike carriers in South Africa and SADC countries, reaching as far as Tanzania and the Democratic Republic of Congo. It also includes island nations such as Mauritius and Madagascar. Along with Thule, Westfalia is one of the biggest bicycle carrier brands in Europe and has been tried and trusted over the last decade by thousands of biking enthusiasts. The product will surely gain the confidence among the local biking fraternity as a leading bike carrier product. This new agreement will provide South African consumers with a top-quality brand at a very competitive price. A spokesman of Positive Sports Solutions said they were in the process of establishing a network for selling the product which would be primarily online based. The bicycle carrier has expanded dimensions of 1260 x 660 x 690mm (W/H/D) with compact and easy storable folded-up dimensions of only 580 x 225 x 690mm (W/H/D). The carrier will firstly be launched as a two-bike . . .